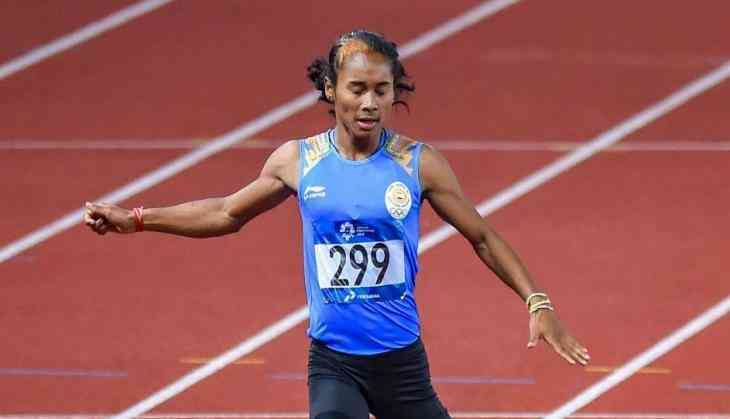 Indian sprinters Hima Das and Muhammed Anas bagged silver medals in their respective categories of 400m race at the ongoing 18th edition of the Asian Games on Sunday. While Das finished second on the podium with a clock timing of 50.59 in women's 400m event, Anas clinched the silver as he clocked 45.69 in the same event in men's category. In women's event, it was the Bahraini sprinter, Salwa Naser who clinched the gold medal with a timing of 50.9 while Elina Mikhina of Kazakhstan settled for the third spot as she clocked 52.63. In men's 400m event, Abdalelah Hassan of Qatar bagged the gold medal with a timing of 44.89 and Bahrain's Ali Khamis won bronze as he clocked 45.70. Indian sprinter Dutee Chand qualified for finals after finishing third with a timing of 11.43 in the semifinal of women's 100m racing event. India's total medal tally at the prestigious tournament now stands at 33 with seven gold, nine silver and seventeen bronze.